Our October 2018 "Woman in Ag" feature is Michelle Page. Michelle has dual roles. She is both the Executive Officer for Minnesota Farm Service Agency (FSA), and she is a cattle farmer in northern Minnesota. Michelle balances a lot each week, including a six hundred mile roundtrip commute! As I read Michelle’s responses, I was impressed by her commitment to sharing her 40 years of career experiences and knowledge with others in agriculture, particularly those in the early stages of their careers. Michelle shares more about herself in her responses below. 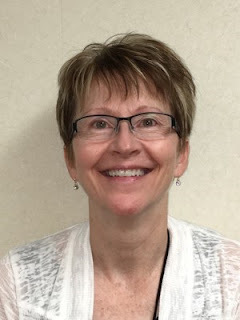 Michelle: I am currently the Executive Officer for the Minnesota Farm Service Agency (FSA) in St. Paul. I have worked for FSA for 40 years in a variety of positions. My FSA career began in Crookston, MN as a Program Technician in the West Polk FSA Office, serving in that capacity for 25 years. I was hired as a manager trainee in 2002 and served as the County Executive Director in the East Polk County FSA Office, McIntosh, MN for 7 ½ years before accepting a position in the Minnesota State FSA Office in 2011. While in St. Paul, I have served as a Chief Agricultural Specialist for disaster and production programs, served as Acting State Executive Director during the transition of administrations, and most recently as Executive Officer. My entire career has focused on serving Minnesota farm producers. Although I spend the workweek in St. Paul, Northwest Minnesota is home. I was raised on a small grain, sugar beet, and potato farm near Red Lake Falls, MN. My husband and I own a registered Black Angus operation a few miles from where I was raised. My current contribution to the cattle operation is bookkeeping and moral support. The weekly round trip commute of 600 miles does not allow much time for any hands-on involvement on the farm. WAGN: What is a professional success you are proud of? Michelle: As Chief Agricultural Specialist, I was responsible for leading Minnesota FSA in the rollout of 2014 FSA Farm Bill programs. That involved providing four statewide training meetings for all of our Minnesota program staff in 12-months. For me, the success was not only accomplishing this task but tapping into some of our less-tenured FSA field staff to assist in the training. At this stage in my career, I find it is satisfying to provide opportunities for less experienced staff to experience new challenges and develop professionally. It is a win-win since providing these opportunities motivates me as well! WAGN: What is something you’d like to share with other MN women in ag? Michelle: Take the time to share your experiences with others, particularly women in the early stages of their agricultural careers. Sometimes it takes a nudge of confidence from a co-worker, supervisor, or friend to realize your potential. All too often, others see our strengths when we fail to recognize them ourselves. WAGN: What is something you learned at a WAGN? Michelle: I attended a WAGN quarterly workshop in Willmar where Ted Mathews spoke about farm families and dealing with stress. It was interesting hearing about experiences and concerns other attendees at the event had encountered. I never dreamed that two years later, I would be sharing my personal ag-related stress story from the late 1980s as a member of the Down on the Farm Workshop team, hosted by the Minnesota Department of Ag. Minnesota FSA is a collaborator with Extension on the Women in Ag Network (WAGN). Thanks Michelle for sharing your story with WAGN for this month’s “Woman in Ag” feature.